French farmers join the blockade from a motorway junction along the A16 near Calais, France, as part of a campaign for the Jungle migrant camp to be demolished. A blockade of lorries is causing chaos on the roads around Calais in a campaign for the Jungle migrant camp to be demolished. British cross-Channel travellers face disruption and delays as French shopkeepers, police, unionists and farmers join hauliers in blocking the motorway around the port. A human chain was also formed across the road leading to the ferry port, near the football stadium, Stade de l'Epopee. Protesters marching along the motorway were holding banners and waving placards. Despite efforts to reduce numbers by dismantling the slum's southern section earlier this year, up to 9,000 migrants from countries including Sudan, Syria and Eritrea are living there in squalor. People traffickers are reported to be going to extreme lengths in Calais in their efforts to reach the UK, with vehicles being torched, petrol bombs thrown and trees being cut down to block roads before drivers are threatened with chainsaws and machetes. Gangs are paid thousands of pounds by vulnerable people to get them to Calais, from where some are smuggled to Britain to work to pay off huge debts to people traffickers. Migrants have even been deliberately causing car crashes on the roads to the port by hurling large objects at cars and then stowing away on lorries caught up in the traffic jams that pile up behind. 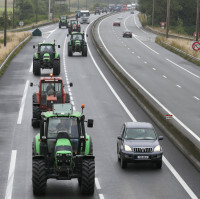 A group of farmers in tractors waiting to take part in the blockade on the A16 say they "want the town back". "The camp needs to go," one added. They say conditions are getting worse and they are seeing more and more violence. Presidential hopeful Nicholas Sarkozy called for a renegotiation of Le Touquet agreement, a collaboration between Britain and France on border controls, which was signed in 2003. In an interview with French publication La Voix du Nord, he says most people who go to Calais want to travel to Britain and UK asylum claims should be dealt with by the British Government. He added that France should stop being "as lenient to those who do not respect the criteria of asylum". Tourists are always advised to take out trusted travel insurance if they are taking a trip abroad.